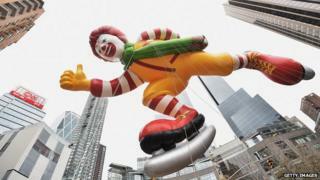 Sales at McDonald's outlets in the United States fell 4.6% in November - more than double the expected decline. Global sales for the fast-food chain dropped 2.2%, in their sixth consecutive monthly fall. Like-for-like sales at McDonald's have not increased since October 2013, as smaller rivals eroded its market share. Consumers have been opting for healthier and more varied offerings at outlets such as Chipotle, which allows diners to customise their dishes. The Mexican food chain reported a 20% rise in like-for-like sales for the three months to September 30 - the third quarter of double-digit increases. Sales for McDonald's in the Asia/Pacific, Middle East and Africa markets were down 4%, hit by a China meat supplier scandal that scared off customers and forced the company to find new sources for its chicken and beef. In Europe, sales dropped 2% in November, as a strong UK performance was dragged down by a "very weak" Russian market and negative results in both France and Germany. In August, Russian authorities forced several Moscow outlets to close over alleged hygiene breaches. The move came amid Western criticism of the Kremlin's support for separatists in Ukraine. Don Thompson, McDonald's chief executive, said the chain was simplifying its menu, improving marketing and giving more control to local operators. "Today's consumers increasingly demand more choice, convenience and value in their dining-out experience," he said. Analysts polled by research firm Consensus Metrix had expected sales at stores open for more than 13 months to decline by 1.9% in the US and 1.7% worldwide. Shares fell 3.8% in New York to $92.61. The stock has been largely flat this year. McDonald's results have also been hit by the strong US dollar. Last month, the fast food giant said it would move into its 120th global market by opening outlets in Kazakhstan next year. It has more than 35,000 locations that serve about 70 million customers a day. Image caption McDonald's sales in China were hit by a meat supplier scandal. On Thursday last week, thousands of fast-food workers marched in nearly 200 cities around the US to call for a sharp rise in the minimum wage and union rights. Diamond Jackson, 18, a McDonald's worker in Knoxville, said she wanted to become a nurse like her mother, but could not afford to study. "I make $7.25, and we're out here telling people that we can't get by on that". Unions want the federal minimum wage increased to $15 per hour from $7.25, where it has remained since 2009. Fast-food chains including McDonald's say that most of their outlets are owned by independent operators who are responsible for pay rates.